Vibrant colors, deep blacks, and tack sharpness are the hallmarks of glossy photo papers. Glossy photo paper is a top choice when you are printing high contrast images or photos that demand the ultimate color density. You now have access to some of the best photo inkjet paper on the market at prices well below retail brands. Get ready for prints that will amaze your friends, family, and clients. Compare to retail brand glossy photo papers. These papers have the look and feel of a traditional photo lab glossy print. The top selling gloss, UltraPro looks and feels like traditional photo lab glossy paper. The new Polar Gloss Metallic 255 is a truly unique inkjet paper that closely matches the look of photo lab metallic prints. Traditional coated gloss. Single sided products are plain paper on the back, suitable for text and light graphics printing. This light weight high gloss has a plain paper back suitable for printing. Good for books, portfolios, and more. Pecos is one of a kind in North America - a super smooth pigment friendly high gloss with a plain paper back. DUO features a high gloss surface on both sides for brilliant photo reproduction with dye and pigment inks. Red River inkjet photo gloss looks and feels like traditional glossy photo lab paper. UltraPro, Arctic Polar, and Polar Gloss Metallic 255 are resin coated, photobase inkjet paper with a brilliant photo gloss surface. Our glossy photo inkjet papers print bright colors and ultra sharp details on virtually any inkjet printer, including ones that use pigment inks. Glossy photo paper is a top choice when you are printing high contrast images or photos that demand the ultimate color density. Gloss paper reflects the most amount of light, hence your eyes will see the most color saturation, density, and brightness. no markings on the back. Red River glossy photo papers are as good as or better than the major retail brands like Epson, Canon, and HP. We buy our papers from some of the same sources as the big names. The difference is that Red River brings the paper direct to you with only one stop on the way from the paper mill - our manufacturing facility in Dallas, Texas. Photo glossy papers like UltraPro Gloss 2.0 and Arctic Polar Gloss save you up to 40% over retail prices and offer the same performance as you've come to expect from the retail names. Glossy photo paper from Red River Paper is carefully chosen to meet not only our standards, but yours as well. We test our papers with many, if not all of, the printer models available from Epson, Canon, and HP. Compare our quality, service, support, and shipping speed and you will love buying photo glossy paper from Red River. Using another brand? Contact us and we will suggest a replacement. For your best images, consider glossy photo paper if your content has a high level of contrast or is highly saturated. The highly reflective surface yields brilliant color saturation and deep black density. 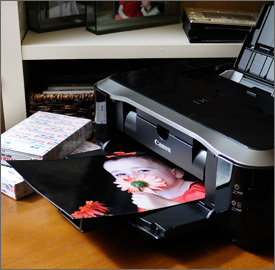 For every day photo printing, look to glossy photo paper. Photo labs traditionally use gloss printing paper to make sure many different images look great. UltraPro Gloss 2.0 comes in 4x6 and 5x7 sheets for your snapshot printing. Photo books have become very popular. Gloss paper is a good choice for single side page photo books. Photobase inkjet paper like UltraPro Gloss 2.0 withstands handling well and will work well for photo book projects of all sizes. If you're portfolio contains high contrast black & white, deeply saturated commercial images, or work from a recent photo adventure, consider high gloss paper for your printing needs. Again, its ability to withstand handling makes UltraPro Gloss 2.0 a great candidate for the project. The best way to familiarize yourself with various glossy paper is to try them by purchasing a small quantity. A good idea is to print something from each genre of your photo library to see how the media represents your work. You can order UltraPro Gloss 2.0 above. Also consider the 5-Star glossy Arctic Polar Gloss here.